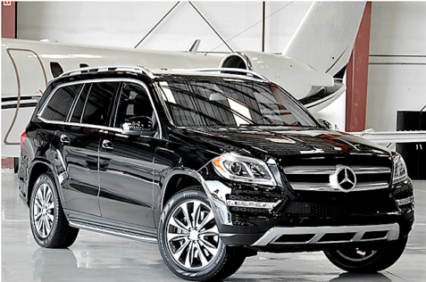 Black Diamond is proud to include the luxurious Mercedes-Benz GL550 sport utility vehicle (SUV) in its fleet. This full-size, three-row, six-passenger vehicle is the flagship for the Mercedes-Benz SUV line, and deserving of the title with its well-appointed and elegant interior, technological advances, and impressive power. The GL is perfect for families and small groups who expect class and style from their private transportation service. Safe, spacious, and powerful, this SUV was built for Colorado travel and made for the winter season. One Car and Driver magazine reviewer called it, “the ultimate snow machine”, a common rave by others familiar with its snow conquering prowess. As a passenger in the Mercedes-Benz GL, you are treated to a smooth and quiet ride which allows you to relax in an opulent and comfortable setting while being chauffeured to your destination. Such an experience is especially welcome after a long plane ride or a busy day in meetings, and a must for long-range travel through the mountains. The GL is equipped with heated front and rear seats and separate climate control features for front and back passengers. After you chose the environmental settings desired to meet your comfort needs, you will have the convenience of internet access, viewable on seatback-mounted television monitors. In addition to riding in comfort and enjoying the modern conveniences of the Mercedes-Benz GL, as a passenger in the GL you can rest assured you are in a vehicle with high safety ratings and equipped with the latest safety features designed to protect you, your colleagues, and family members during your travels. When you want to leave the driving to another, but demand a luxurious ride in a spacious vehicle, Black Diamond is ready to accommodate you with a comfortable, safe, and stylish journey in our Mercedes-Benz GL SUV. Call us today to book your private ground transportation (970) 261-6509 . Meet & Greet Procedure: After you will pick up the luggage, please call Customer Service (970) 261-6509 to let us know that you are ready to be picked up. Your Driver will pick you up within five minutes after your call.